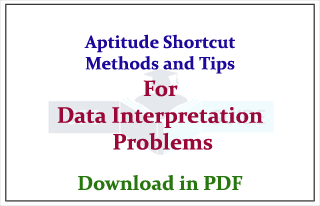 Aptitude Shortcuts methods and Useful tips that used in aptitude questions related to Data Interpretation Problems were given below in pdf. 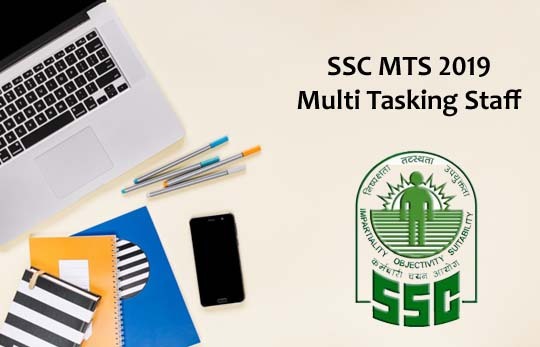 Candidates those who are preparing for SSC/FCI and all other competitive exams can use this. 1 . Data Interpretation questions are based on information given in tables and graphs. These questions test your ability to interpret the information presented and to select the appropriate data for answering a question. 2 . Get a general picture of the information before reading the question. Read the given titles carefully and try to understand its nature. 3 . Avoid lengthy calculations generally, data interpretation questions do not require to do extensive calculations and computations. Most questions simply require reading the data correctly and carefully and putting them to use directly with common sense. 4 . Breakdown lengthy questions into smaller parts and eliminate impossible choices. 5 . Use only the information given and your knowledge of everyday facts, such as the number of hours in a day, to answer the questions based on tables and graphs. 6 . Answer the questions asked and not what you think the questions should be. 7 . Be careful while dealing with units. 8 . To make reading easier and to avoid errors observe graphs keeping them straight. 9 . Be prepared to apply basic mathematical rules, principles and formulae. 10 . Since one of the major benefits of graphs and tables is that they present data in a form that enables you to readily make comparisons, use this visual attribute of graphs and tables to help you answer the questions. Where possible, use your eyes instead of your computational skills. Tables are often used in reports, magazines and newspaper to present a set of numerical facts. They enable the reader to make comparisons and to draw quick conclusions. It is one of the easiest and most accurate ways of presenting data. They require much closer reading than graphs of charts and hence are difficult and time consuming to interpret. One of the main purposes of tables is to make complicated information easier to understand. The advantage of presenting data in a table is that one can see the information at a glance. While answering questions based on tables, carefully read the table title and the column headings. The title of the table gives you a general idea of the type and often the purpose of the information presented. The column headings tell you the specific kind of information given in that column. Both the table title and the column headings are usually very straight forward. There may be four types of graphs. 1) Circle Graphs: Circle graphs are used to show how various sectors are in the whole. Circle graphs are sometimes called Pie Charts. Circle graphs usually give the percent that each sector receives In such representation the total quantity in question is distributed over a total angle of 360°. While using circle graphs to find ratios of various sectors, don't find the amounts each sector received and then the ratio of the amounts. Find the ratio of the percents, which is much quicker. 2) Line Graphs: Line graphs are used to show how a quantity changes continuously. If the line goes up, the quantity is increasing; if the line goes down, the quantity is decreasing; if the line is horizontal, the quantity is not changing. 3) Bar Graphs: Given quantities can be com-pared by the height or length of a bar graph. A bar graph can have either vertical or horizontal bars. You can compare different quantities or the same quantity at different times. In bar graph the data is discrete. Presentation of data in this form makes evaluation of parameters comparatively very easy. 4) Cumulative Graphs: You can compare several categories by a graph of the cumulative type. These are usually bar or line graphs where the height of the bar or line is divided up proportionally among different quantities.